Heading down to Avalon, Stone Harbor, Wildwood or Cape May in New Jersey? Looking for something free to do while you're there? If so, you'll want to check out the historic and funky Doo Wop Museum in Wildwood! 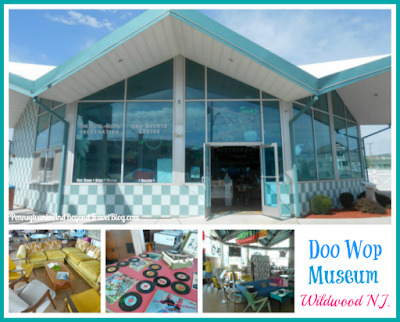 The Doo Wop Preservation League Museum is located right across the street to the Wildwoods Convention Center. The physical street address is 4500 Ocean Avenue. If you're looking for a place to park, I recommend parking in the Convention Center parking lot and walking over to the museum. You can then visit the Wildwoods Vietnam Memorial Wall (to the left) while you're there. In regards to admission, it's FREE! There is a donation bucket on the counter where you can drop in a monetary donation. If you're looking for some fresh fruit, on-the-go snacks and cold beverages, you can purchase a few of those while you're there too. They don't have any public restrooms on-site. If you need to use the restroom, you'll have to walk across the street and enter the Wildwoods Convention Center. As soon as you walk up to the building you'll recognize the Doo Wop architecture and style. The museum is inside that building which used to be an old restaurant that was relocated to the site. It's funky, fun and definitely colorful. Once you enter through the doors, I recommend heading to your right. You'll want to stop and watch the mini video to get some important history on the building and the Wildwood area. Your tour through the museum is self-guided which means you'll move through the museum at your own leisurely pace. The day that we visited we were the only patrons there, so we really took our time and looked at everything they had to offer. As you're walking along, don't forget to view the items hanging on the walls and please, LOOK UP! You'll find some cool items hanging from the ceiling too! My mother was a teenager during the Doo Wop era, so we took her along with us. It was fun to see her relive memories from her childhood and teenage years. She recognized a lot of the items that they had on display and told us even more about them. Since I love home decor and decorating, I took great interest in that, while my husband enjoyed looking at the vintage appliances, old records and signage from the era. There were two senior-aged employees there and they were really great! They were more than happy to speak with us and answered some of the questions that we had. They were both very knowledgeable on the Doo Wop era and the Wildwood area. They even gave us some recommendations on where to dine and on other places that we could visit during our trip to the Jersey Shore. We spent about 40 minutes at the Doo Wop Preservation Museum looking around. It's a small museum, so you'll want to set aside 30 to 45 minutes in your schedule to explore. I think its a great activity to do especially during a rainy beach day or a day when it's just too hot to be out on the beach and/or walking the Wildwoods Boardwalk. After you're done at the museum you can walk right next door and check out the Wildwoods Vietnam War Memorial Wall and there is a small Korea War memorial there too. We spent about 15 minutes reading the information there and checking out the wall. It was a very humbling experience for us and educational too. Note: You can double click on each photo in this travel feature and have it open up in a new browsing window and in an enlarged size. This will allow you to see the smaller details up-close, while keeping our travel blog mobile-reader friendly. Thanks! I think I would really enjoy exploring this museum and reliving old memories The photos by themselves already made me remember things from my past.